A good mentor program effects on-boarding so new employees stay longer. Measure how many, and how long employees stay. ie; 12 weeks, 6 months, 1 yr., 2 yrs. When measured you will see how this benefit translates into reduced hiring costs. How much does it cost you to hire an employee? How many did you hire last year for existing positions and for new positions? Training is enhanced with effective mentoring and employee’s learning curves increase so employees are more productive and happier. This is measured by measuring work performance. How do you measure and track your different groups work performance? Do you need a system? You can learn how to measure productivity on line or with a consultant. You can track things like sales, customer service call length and repeats, shipments per day, forms per day, etc. Measure it consistently to improve. Watch how your mentor program reduces things like customer service call times and repeat calls. Communication and information flow is expanded so employees are more informed, happier, satisfied and therefore more productive. You can track employee satisfaction with surveys and measure improvements. Some companies measure employee satisfaction once every five years, others more often and some never. Employee satisfaction translates into improved performance and employee retention — both measurable in dollars if you put in the systems to track employee hiring costs and productivity. Future leaders are identified thereby managing talent asset succession. Tacit knowledge (knowledge that cannot be written down) is transferred from the mature part of the workforce to the future leaders. We’ve found that young people love mentor programs. Old people resist them. They don’t know how to mentor, are worried about time requirements put on them and doubt the benefits. Train your mentors and utilize them to identify the best future leaders. Those that are identified as the future leaders will develop a sense of loyalty and stick around longer. They will pass on the knowledge as well. Your culture becomes one of learning in collaboration and the sense of belonging is developed. This learning process moves throughout your work culture, so you build healthy workforce and add longevity to you business. Leaders control the growth of your company. Mentor programs help them lead more effectively and communicate better with the team. Your leaders are responsible for growth. When they are given the tools to lead, and properly trained people to work with, your company grows. When you add masterminding systems into your business learning environments you can improve sales and customer service dramatically. Assemble mastermind systems for your sales people and your customer service people. Have your sales teams and your customer service teams meet daily at the end of each day and talk about every call they made. The wins, the challenges, what he said, what she said, what worked, what didn’t, etc. Keep the meetings as short as you can but allow enough time for each person to share the important details of each call they made that day in round table discussion. The learning curves for each team member increases rapidly and they perform much better. You might get some negative response to this idea at first, but after 2 or 3 months each member will see the value and realize the benefits. Sales people buck daily meetings but when they see sales increase they buy in. Your company sales will grow and your customer service will be the best in class. Customer retention will be better than ever. Customer acquisition is usually much more expensive than customer retention. Give them the best service and you will see them come back again and again and recommend you to their friends. I was part of a young sales team where all the sales guys were under thirty. We met every day sharing every sales call with the team. There were 4 sales guys and a manager. He was under thirty too. All of our competitor’s sales teams averaged an age over 40. We kicked their buts after 2 years of meeting daily. We increased sales year over year by 30% while I was there in it was one of the toughest economies Alberta ever saw in the mid 1980’s. I helped a paper company set up a masterminding system for a new customer service team. The company just opened in a new market and a customer survey told them the competitors had more knowledgeable customer service people. We set up a daily pow wow’s where the 4 team members, and their manager, met at the end of every day and discussed each important CS call. The learning curves of each Customer Service person increased rapidly, and effectively, so the next time the survey was done, the issue never showed up and the company achieved 1/3rd market share within 3 years of entering the market. 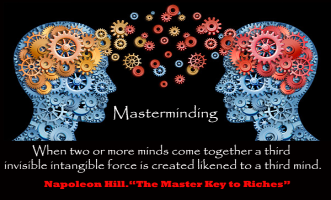 Masterminding works really well to increase learning curves, engagement and accountability. The ROI from an effective mentor mastermind program comes in the form of cost savings for people hiring and development, and is enhanced by increased customer service, resulting in customer loyalty and increased sales. FindAMentor.com can help you with culture assessment and effective implementation. We can help you with training mentors and implementing mastermind systems. We offer the only ISO recognized mentor training available in the world at this time. ISO-17024 compliant. We can help you measure program effectiveness and employee satisfaction with our surveys. If you think you might be interested in starting a mentor program on your own and want a free mentor program consultation, please go to the Contact Us page and fill out the form or go to the corporate MMP (Mentor Mastermind Program) section at FindAMentor.com for an affordable on line solution to book a demonstration with us. The 5 don’ts for a successful company mentor mastermind program (MMP). If senior management doesn’t fully support the program, it will likely be discarded. Don’t bother starting it. Get buy in and participation from senior management first. There are some key benefits to starting a mentor program that management needs to be aware of in the beginning. Get at least one member of senior management to participate as a mentor. Get at least one member of senior management to be a part of the mastermind team that is responsible for implementing the program. The program champion or administrator must provide reports on how the program is providing ROI. Compare past retention rates to new ones year over year. Include retention rates on new hires. How many stay how long? Compare hiring costs yr. over yr. How many new hires? How many are replacement positions? How many are new positions? How much are you spending on training for employees yr. over yr.? (Include internal training soft costs — how much time are managers or other employees spending on training, and external programs) You can hire a consultant team to help you with measuring ROI for a mentor program. Follow suggestions in item 5 on this list. Don’t start without a system to implement and manage the program. If you leave the mentor program up to chance and just encourage it without providing clear guidance for the participants, it will likely fall by the wayside. Set up systems to match partners as well as guide and track mentor sessions. Either get an online system to do it for you and provide reports, or build a manual one tracked within a file system. Create your own reports for the management and the participants. Let people know what’s going on with the program. Track ROI. Don’t start without providing mentors with training. Mentors often don’t know how to mentor. Train them. Hire an external trainer or make some online courses available to them. FindAMentor.com offers ISO 17024 Certified Mentor Training. Don’t start if the company culture doesn’t support mentoring. You can do a culture assessment to see if the company is ready for a mentor program. Who are the senior management people that see value in the program? Will one or more of them participate? Do you have people capable of mentoring that see the benefit in mentoring? How many? When we’ve implemented mentor programs for companies, there haven’t always been enough mentors that are willing to participate or that see the value. Often it’s because they have no idea how to mentor someone. They want and need a format and structure guidelines to follow. Don’t make people mentor someone if they don’t want to. There have always been mentees willing to participate and who look forward to the program. People like to learn and increase their perceived value to the workplace. They often see having a mentor as a way to grow their value. Don’t start if you’re not willing to track results and effectiveness and make changes. Measure and adjust effectiveness of matches and sessions. Rate mentees progress and compare to other mentees in program. Use surveys and one-on–one inquiry sessions to see what participants think about making the program better. Do it over time. Give your program 2 years to evolve and make adjustments every six months and minimum once per year. Measure the things for tracking ROI in item 1. See the 4 Key measurable benefits of a mentor program that provides ROI — tracking and measurement is required . Check other blog posts. FindAMentor.com can help with culture assessment and effective implementation. We help you with mentor training. We can help you measure program effectiveness and employee satisfaction with our surveys. Fill out the form at FindAMentor MMP to get a free consultation to help you with your existing mentor program or to see if you’re ready for our mentor mastermind program now. Thanks for reading. Have a wonderful day. In theory, leaders, managers, and employees largely agree on the importance of a having a mentor program. Corporate mentor programs are often named as one of the Top 5 reasons people choose an employer. This moves into the Top 3 when you whittle down the list to Gen Y, Gen Z, and High-Potentials. More and more companies are acknowledging the weight and importance of a mentor program, but the programs often fall short of expectations from all sides. When the urgency is cranked up within an organization, which it almost always is, mentor programs often don’t garner much attention from executive leaders. Who can blame them? What’s the ROI on a mentoring program? Not very high in most cases, but why? To answer this question, we must examine the reason most mentoring programs are setup in the first place and how they are most often implemented. Beyond recruiting, most organizations actualize very little of these desired benefits. Often it’s not from a lack of energy, desire, or time. In fact, mid-level managers frequently spend a disproportionate amount of time engaging in activities they define as “mentoring” compared to the benefit to the mentee, mentor, and organization. The single biggest reason why corporate mentor programs fail to live up to expectations is simple; LACK of STRUCTURE. Let’s visit the difference between a structured and unstructured mentoring program. After a short review of these differences, which type of program do you think is more beneficial to all parties? If you answered “STRUCTURED” as most people do, then why do most programs contain very little structure. The simple reason is time. Structuring a mentoring program takes time and with urgent and important activities tugging at employees and organizations all day long there is very little time to structure a program that truly yields the desired benefits. So why should your organization spend the time and energy to structure its mentoring program? Because, if not, you’re just WASTING TIME.